How to avoid weight gain during the holiday season. Let the parties begin. 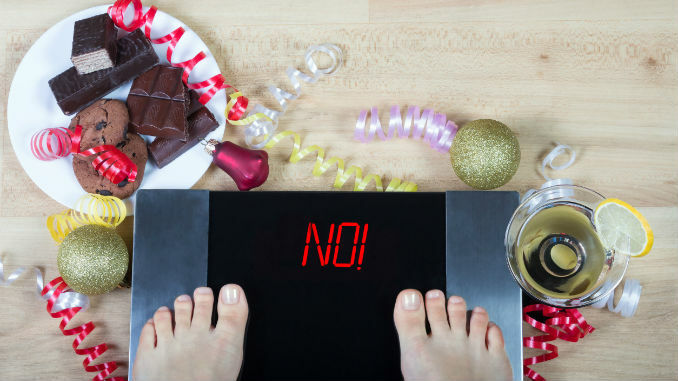 The holidays are upon us and for many that means unwanted pounds begin creeping in, too. But it doesn’t have to be that way. You can combat your natural tendency toward weight gain and do something different this year. Why not incorporate a few easy habits to avoid those unwanted pounds? It could be the solution for maintaining your weight throughout the holiday season and modeling healthy behaviors your children will learn from in the process. Share a dessert when you’re out to eat. Consume five or six small meals per day instead of three large ones. Drink water and eat a salad or large piece of fruit before going to a party. Be mindful that sugary foods make you crave more sugary foods. Lewis also emphasizes keeping your exercise routine in place and, when shopping, selecting parking places that require extra walking. But remember: It takes a lot of exercise to burn an overload of holiday eating. Cindy Hendricks, a mom of four who recently lost 60 pounds, says her best tool to keep from overindulging at holiday social functions is to make up her mind to eat one unhealthy thing. That keeps her from feeling deprived but doesn’t destroy a healthy eating plan. She also chews gum when tempted to eat things she shouldn’t. It’s also possible to avoid holiday weight gain if we train our minds differently. Our behaviors follow our thinking. I’ve heard it said that almost 90 percent of our thoughts are negative! So it’s no wonder we struggle with behavior change. Replace that negative thinking and gain inner strength to overcome temptations. Positive affirmations go a long way in keeping us on track. When that negative self-talk begins — “You know you always gain weight this time of year. Why do you think this year will be any different?” — banish it with an affirmation: “I can control what I eat and choose to make positive healthy choices.” Training your mind to replace negativity with positive affirmations will help you make better eating decisions. The holidays are also a great time to incorporate a walking or running program that will also help combat the stress you may be feeling. All you have to do is get off the couch and step outside. If the weather’s not cooperating, find a nearby mall or gym where you can walk laps. Take your child with you and model the importance of exercise, even amidst a busy schedule. Drinking plenty of water also helps flush out toxins and fats that come with holiday eating, in addition to filling your stomach and offsetting hungry urges. Drinking water instead of alcohol at social gatherings also greatly decreases your calorie consumption. Another healthy eating tip includes replacing everyday pantry snacks with healthy holiday treats. Cristal Reynolds, mom of two, says she keeps seasoned nuts, party mixes and dried fruits in her pantry for snacking. By keeping healthy snacks available instead of sugary sweets, we’re more likely to make good choices and teach our children to do the same. She also suggests using non-fat and low-fat ingredients in holiday recipes when possible. When you cave to your temptations, Lewis suggests one last tip that’s especially helpful: “If you overeat at a meal, don’t get discouraged and give up. Pick up with your healthy eating at the next meal.” Don’t let it drag on. It’s easy to fall off the wagon and stay there. But if you choose to immediately pick yourself back up, the pounds won’t pile on. Holiday weight gain isn’t inevitable. And teaching our children how to maintain healthy habits through the holiday season is important, too. It takes intentional effort, but the benefits of healthy choices far outweigh the costs of holiday indulgence. Gayla Grace is a freelance writer and author of Stepparenting With Grace, A Devotional for Blended Families. At holiday parties you’ll find her snacking on the crudités.